OM Arts International: Bill Drake Band Celebrates the Christmas Season in Lebanon. Bill Drake Band Celebrates the Christmas Season in Lebanon. “I enjoyed tonight. It was exciting to play on board Logos Hope. 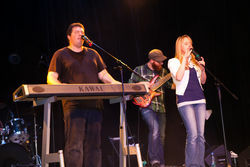 The audience's reaction was fantastic,” said musician Bill Drake after a Christmas concert in the Hope Theater. Keyboardist and singer Bill and his band played a set of Christmas carols and other numbers to a mixed audience of ship’s company and local Lebanese. In between songs, Bill shared about his own life. He told the audience how after a troubled upbringing nearly caused him to commit suicide, he had found peace by getting to know God. He introduced one song by talking about what the first Christmas would have been like. “I love Christmas as it’s such a natural message. To encourage Lebanese people with their Christmas celebration is a dream come true,” Bill added. Thanks for going Bill with Good News for the people of Lebanon. Many were holding you and the other goodwill ambassadors on board up in prayer.